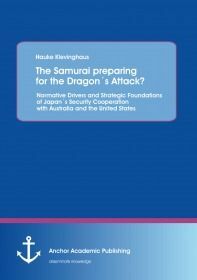 The book offers an exploration and analysis of the ideational motives which drove the establishment of the ‘Trilateral Strategic Dialogue’ (TSD), a milestone defense framework that was concluded between Japan, Australia and the United States, in March 2006. Among realists the TSD was quickly identified as power-balancing of the three countries to counter a rising China. However, non-material reasons to establish a common forum for security cooperation are evident. Not only are the three allies democracies, but Japan, and especially Australia look back on decade-old alliances with the United States. Utilizing a constructivist approach, the author argues that the establishment of the TSD can be accounted for by a strongly perceived collective identity between the leaders of the three countries, constituted by shared norms and democratic values. The book sheds light on the normative drivers of the process, and assesses the impact of values by which the leaders of Japan, Australia and the United States mutually connected. It explains the normative mechanisms which led to a security relationship that would grow to unprecedented levels of intimacy. The book highlights the goals and objectives of the Trilateral Strategic Dialogue, and further, explains why South Korea, a democracy and ally of the United States, is not added to the framework. Moreover, the book outlines the role of the Trilateral Strategic Dialogue as one step in the greater strategy of the three governments to establish a community of democratic states in the Asia-Pacific.